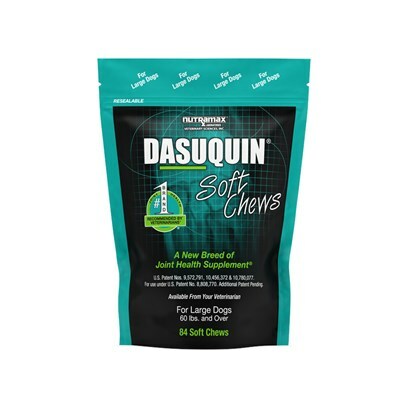 Dasuquin Soft Chews for Dogs is a joint health supplement that eases the symptoms of osteoarthritis. This supplement is not only effective, but is also tasty enough to give as a treat! Options Available: Under 60 lbs. - 84 ct. 60 lbs. and over - 84 ct. with MSM - under 60 lbs. - 84 ct. with MSM - 60 lbs and over - 84 ct. Rated 4.5 out of 5 by 13 reviewers. This product is a great value. Excellant for dogs with arthritis or joint pain. Easy to use. My dog thinks they are a treat. He thinks he's getting a treat instead of medicine! This is an awesome product!